Is live theatre really an effective means of communication in this day and age? Does old fashioned play acting and story telling still work for kids? ‘More than ever’ seems to be the answer as attested to by this story. Every one of the 98 children responded by writing a little story about what the play prompted them to do for an animal. This was proof positive that they completely understood the message conveyed by the live theatre show. 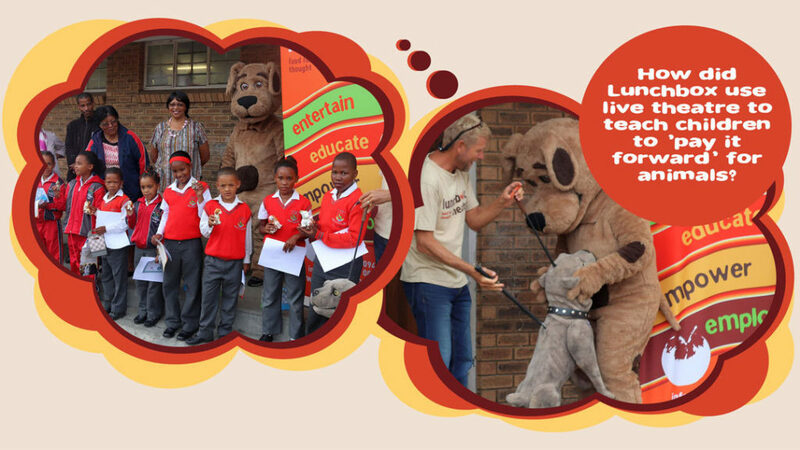 Wafi and Lunchbox Theatre returned to the school with more friends, the Knysna Animal Welfare Society (KAWS) and their mascot, Kaleo (which means The Voice) a week later. Wafi managed to secure some little porcelain cat and dog figurines from his granny – which were upcycled into prizes for the 12 winners. The Winners were delighted with these little ‘virtual pets’ which they named. Adoption Certificates were supplied by KAWS. The Winners were also recognised as ‘Animal Ambassadors’ who will encourage their class mates to be kind to animals. Imagine what we could do if the entire school could participate? Imagine what we could do if all South African children could ‘Pay it forward for Animals’. Take a look at the second Lunchbox Pay it Forward Video and see if this is behaviour you would like to encourage with a donation?